Summer eye makeup should be bright, frisky and fun, just like the sun-kissed days are. Actually, summer is the best time to forget dull and dark colors and go bolder, trying new bright makeup looks that perfectly embrace your cheerful state of mood. Go for bright shades of orange, purple, lilac, pink and color your life, as you add a touch of brightness to your face! We come up with a super-cheerful summer bright makeup tutorial that will inspire you to experiment with va-va-voom color combinations, ones that you have always shied away from! Ready to go? Have a nosey at the summer bright makeup steps! Step 1: Since makeup tends to melt away in summer more often than in any other season, make sure you take some summer makeup tips into account, while creating your makeup base. Ditch your heavy creamy foundation and opt for one with a lighter texture. Apply a moisturizing cream on your face and then move on to the foundation, which should be applied with the help of a synthetic brush for more flawless results. Add a mattifying touch to your face by using a matte powder over the foundation. To bring back the natural flush of your skin, use a blush on your cheekbones after contouring your face with a contouring powder. Step 2: Get those perfectly arched full brows by contouring your eyebrows with an eyebrow kit in the most matching hue for your natural eyebrows. Step 3: Prep your eyes for the summer eye makeup by applying a primer and then a base all over your lids. Step 4: Apply a shimmery white eyeshadow to the inner corners of your eyes. We have used Oyster from the Sleek Lagoon Palette. 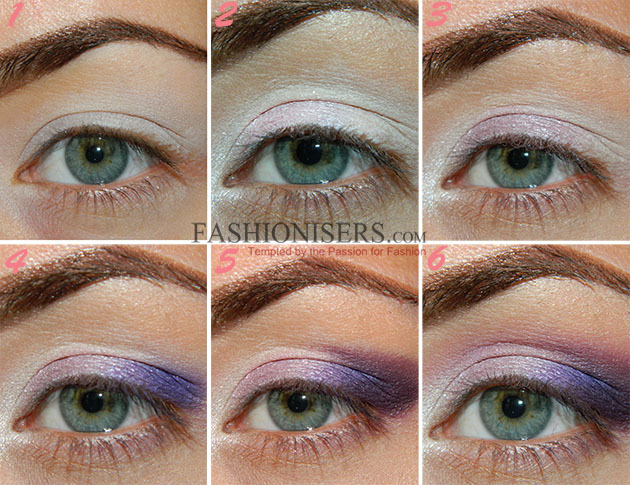 Step 5: Apply a shimmery lilac tone to the middle of your lids (Reflection from the same palette). Step 6: Fill in the outer part of your eye with a matter purple eyeshadow (Highness from the Sleek V2 Darks Ultra Matte Palette). Then apply a darker purple tone (Villan from the same palette) next to it and blend the two colors well together to get rid of any harsh lines. Blend the dark purple to the crease line. Step 7: Above the purple tone, apply a neon coral hue and blend them together (Ariel from the Sleek Lagoon Palette). Step 8: Apply a dark purple eyeshadow on your lower lid starting from the middle and going to the outer part of it. We have used the same dark purple tone here. Blend the color with the help of the lighter purple tone, we have used before. Step 9: Define your eye makeup with black eyeliner applied on the upper and lower lids. Step 10: To open up your eyes and make them look brighter and bigger, apply a white eye pencil on your waterline. Step 11: Finish off your bright summer eye makeup with black mascara and false eyelashes, in case you want to have more mysterious eyes. Step 12: Make your summer bright makeup even brighter by applying an orangy coral lipstick for luscious lips! Wear this summer bright makeup to a party or in the street and make everyone’s heads turn with your sparkling look!